The RAS Solution: Problems with bridges and culverts. Copyright © RASModel.com. 2009. All rights reserved. (Thanks Eric for the topic). It's very common for HEC-RAS models to show inconsistencies around crossings (bridges and culverts). Usually, 1 of 3 things is going on here: 1. Bad geometry-either incorrectly entered, or poorly defined. 2. Numerical errors. 3. The results are actually correct and can be explained. For the first case, "bad geometry", here's a technique that can be used to help spot sources of problems. Create and evaluate the hydraulic property plots for the crossing. If you are running unsteady flow, this is done for you during the geometry preprocessing task. If you are running a steady flow model, you can create an unsteady flow plan and just run the geometry pre-processing task (you don’t need to run the computations or the post-processing. Once that’s done, on the main RAS window, go to View…Hydraulic Property Plots. Click Type…Internal Boundaries, and you’ll see the family of rating curves for your crossing. Here you’ll want to examine the curves and look for any abrupt changes, or discontinuities, particularly in the range of flows/depths where you are seeing the discrepancy. Typically you see problem areas where RAS changes equations (i.e. going from low flow to pressure flow, or pressure flow to pressure and weir flow), or when ineffective flow triggers turn off/on. Also, keep in mind that the equations for culverts are very different from those used for briges in HEC-RAS. Take the following example, in the figure below. First of all, I always like to open up the bridge plot along side its htab plot (make sure the vertical axis is consistent) so that I can graphically explain any discontinuities in the htab curves. This example shows a significant discontinuity at around 10,000 cfs (you can click on the figure above to get a better view). It's very obvious from looking at the plot that this is the range at which the flow transitions from low flow to pressure flow and then on to pressure and weir flow. Also, notice that the ineffective flow triggers turn off in this range. It appears that the creater of this model tried to lessen the impact of the ineffective flow areas instantaneously turning effective by significantly raising up the n-values in the overbank. Not a bad technique, but obviously didn't completely solve the problem. -Coefficients (bridge and culvert coefficients). -Ineffective flow areas upstream and downstream of the crossing. -Placement of cross sections. Sometimes if they are too far from the crossing, or to sparsely spaced leading up to the crossing, it can cause these types of problems. -Consider modeling a bridge as a culvert, particularly if it has a very deep deck and small relative opening. Likewise, consider modeling a culvert as a bridge, particularly if it has a very large opening, relative to the deck thickness (conspan culverts are good examples). If the problem is only a very small discrepancy in upstream head levels, a refinement of the computation tolerances might yield better results. For example, let's say you are trying to provide a "no-rise" condition, and you feel that there should be no rise (i.e. new bridge opening is bigger than old bridge opening with a higher low chord). However, you're results are showing a 1 to 2 hundreths of a foot of rise for the new bridge. This is most likely numerical issue and a refinement of the computation tolerances might yield better results. I have a situation where the wselev jumps up a couple of feet in the culvert cross sections compared to the upstream and downstream cross sections. I have tried changing the modeling approach and all of the other variables I can think of. Any ideas on what would cause this? Thanks Ben. I'm assuming that by the culvert cross sections, you are talking about the bounding cross sections (cross sections 2 and 3, in HEC-RAS "lingo"). Usually when I see a jump in wselev in those cross sections, it is due to non-existent, or poorly-defined ineffective flow areas in those cross sections. Make sure you are properly defining the contraction and the expansion to and from the culvert. I've also seen this phenomenon where the cross section spacing is too coarse around the crossing. You might try interpolating some cross sections and see if that helps. Give that a try, if it's still causing problems, let me know. Actually, it is the two structure cross sections created by HEC-RAS that have the jumps. Cross sections 2 and 3 look fine. I should mention that the model is a dam breach model, so it is unsteady, with a very steep hydrograph. Sorry...my bad. But, I think my comment on the ineffective flow areas still applies, especially now for an unsteady flow model. Imagine a full flowing channel that has to squeeze through a culvert. It needs some distance for that water to contract. This needs to be modeled with ineffective flow areas. However, since it is an unsteady flow model, check the Htab parameters for your culvert first (its easy to do). Try to refine the parameters as much as possible. I'll usually try 80/60/40 for my number of points/curves. Also, provide a max elevation and max flow. This will help to refine the family of curves that RAS uses at this culvert during the computations. If these curves are too coarse, you can get weird results at bridges and culverts. Let me know how it goes. You can always send me a screen shot if you think that might help. You had mentioned that the equations for modeling bridges and culverts are quite different. Does the "Bridge Modeling Approach" (i.e. high and low flow methods) apply to culverts as well? Not for low flow conditions. HEC-RAS will use the inlet or outlet culvert equations for low flow conditions. If the upstream energy surpasses the minimum weir flow elevation, RAS will use the weir flow equation along with the culvert equations (and balance the energies at the upstream end) if the high flow method "pressure and weir" is selected. If the energy method is selected for high flow conditions, I think RAS will still use the weir equation with the culvert equations, but I'm not sure about that. You can easily check that if you have a data set with an overtopping culvert. Just check the culvert detailed output table and see if it lists weir flow. I have two flood flows I am examining. Both result in the culvert being submerged (both upstream and downstream ends) as well as the road overtopping (weir flow). The total flow (weir + culvert) makes sense, but the amount of flow through the culvert is lower for the higher flood flow. In addition the culvert flow (for both floods) is lower than I expected. Is this reasonable? What is HEC-RAS doing to calculate the culvert flow. Looking at the velocity through the culvert the flow makes sense. I'm just not sure why the velocity is low. I have run in to a problem with my interface with Arc GIS, Hec Geo Ras and Hec Ras. I was hoping that you all may shed some light on the subject or refer me to someone that could help. I have be getting conflicting measurements from GIS into Hec Ras. I would measure two cross-section that are constraining a Bridge or Dam in Arch GIS and then compare this to the measurement give to me in HecRas between two of the same xsection. The measurements are much different from one another. I have check and recheck units and my projection NAD_1983_UTM_Zone_19N, That includes all layer that are required for HecGeo Ras, and my TIN. My elevation data is NED Elevation raster data if that helps. The only different projection on the GIS map is the base map that is in GCS_WGS_1984 that should not change anything. Please let me know if you think you can help out with this problem with some helpful hits and troubleshooting Ideas. Hard to say. Are your cross sections skewed in RAS? Could that be the discrepancy? You may want to stip everything down to only the affected cross sections and try to bring them in "isolated". That sometimes helps to identify the problem. Good luck. I am modeling a channel that is turning an 18'x10' bridge into a 28'x10' bridge without raising the road profile. The upstream WSEL for every return event is lower for the longer bridge except for the 500-year. One thing I noticed is that although the WSEL exceeds the elevation of the roadway, HEC-RAS is not picking up any weir flow over the road. I'd appreciate any help in troubleshooting! - by turning on the pressure and weir flow mode (brige modeling approach) the water levels for low flow did change, resulting in a feet higher than modeling with the normal approach (energy only). I thought, switching on the pressure and weir flow mode influences only the high flows? - curiosly the high cord of the brigde has an influence on the water level when calculating "high" low flows (nearly high flow flows) with the modeling aproach energy only. I experienced the following thing: if the height of the bridge (high cord- low chord) is less than approx 3 feet and the water level of the calcuting profile (at the upstream cross section of the bridge) is less than 1/4 lower than the low chord of the bridge at the upstream cross section, then the water level jumps at this cross section (about 1/4 feet). As an effect the water level is higher at this cross section as well as one upstream. I know, it s a bit confusing, but maybe you can help me. Is it only a numerical problem? Thanks for the blog too. The problem you are experiences stems from how HEC-RAS measures the head level upstream of the bridge. By default, HEC-RAS uses the energy grade line as it's reference for the upstream head. Under most conditions, this is fine, and in fact is the correct way to properly account for both potential and kinetic energy upstream of the bridge. However, when the water surface elevation is close to the lower chord of the bridge deck, you may find that the energy level is actually higher than the lower chord, in which case RAS assumes pressure flow (high flow condition), even though the water surface elevation would lead you to believe it is still a low flow condition. This also happens in very fast moving water, where the velocity head can be quite high (again pushing the energy grade elevation above the low chord). To fix this, you can go to the Options menu item in the bridge editor and select "Pressure Flow Criteria". Then select the option for "Upstream water surface". Also, the same thing can happen when you are near the transition from pressure flow to pressure and weir flow (RAS uses the energy elevation to determine when it switches from pressure flow to pressure and weir flow). In that case, you can increase the minimu weir flow elevation in the Deck/Roadway editor to take care of that problem. Long-time fan, first time poster. Do you have any guidance for the selection of the pressure flow criteria? I understand that in most cases the default EGL contact with the low chord is sufficient, but we have a special case where the HGL is well below the low chord, but the EGL is in contact, and so of course there is a big difference in results depending on the pressure flow criteria. The HGL is clear of the soffit, but if the EGL method is used, it induces marginal overtopping. Conceptually, I suspect the HGL is the more appropriate indicator for the point at which pressure flow should be calculated, but is there a hydraulic / real world premise I am overlooking where the more conservative (EGL) could in fact induce pressure flow, and thus should be taken as our design condition? Any advice or direction to a reference would be great. EGL is used because of the conservative assumption that any disturbance in the flow (debris, etc.) could bring the HGL up to the EGL level. If you have a supercritical reach, or if you suspect that the HGL is so far under the deck that using the EGL is not appropriate, then change the pressure flow criteria. Its really just up to your own judgment. I have a stupid question, but I am confused about defining the cross sections upstream and downstream of a bridge or culvert. The manual says there should be four cross sections: two upstream (one immediately, and the other further). Same for the DS. But after I define the culvert and run the steady flow, Hec Ras makes two cross sections of "Culv U" and "Culv D". Are these cross sections those that the manual refers to as cross sections immediately US and DS? In other words, is it correct to just define a cross section further upstream and a cross section further downstream of a culvert? You are correct in defining 4 cross sections. HEC-RAS will then automatically create 2 additional cross sections which represent the geometry just inside the bridge or culvert. These are Culv U and Culv D (or Bridge U and Bridge D, if you have a bridge), NOT the cross sections immediately US and DS. They combine a copy of the bounding cross sections you entered and the embankment geometry. Excellent! Thank you Chris for the prompt response. It was really helpful. I have another question. We have always read and talked that these cross sections should be immediately US or DS of the bridge face. I know they should not be very close (let's say 1 ft), and not very far from the bridge. But is there a way to determine the distance of these four cross sections as a function of bridge\culvert size, or in terms of stream dimension? Yes, there is guidance in Appendix B of the HEC-RAS Hydraulic Reference Manual. I am currently reviewing a HEC-RAS model to verify accurate results for the current site conditions, we will then use the model for a new proposed dam that meets no rise criteria. My question is, the consultant that did the model did use ineffective flow areas for the bridges and I have verified that they are indeed correct (or at least close enough for my comfort). However, at the location of the current dam they also included ineffective flow areas. I am wondering do the same rules for placing XS 4,3,2 and 1 apply to dams as they do to culverts and bridges? I am asking because they included cross-sections immediately upstream of cross section 3 (less than 10 feet away actually), but they do not include any ineffective flow areas here. If you could point me in the right direction on how to use IF areas with dams that would be great! We are running 100yr steady flow events for verification. Perfect, just wanted to verify, Thanks! I have a single span bridge model with one WS profile (500 yr) that overtops the roadway and all the other profiles are passed through. I am concerned about my surface profiles crossing each other starting at the upstream face of the bridge. The 500 yr WS profile, which overtops the roadway, drops below my 100 & 50 yr profiles for a few sections upstream before it rises back above the 100 & 50 further upstream. Is this normal and due to the weir flow of the overtopping condition? I have the normal ineffective area cones (1.0 & 2.0) and 0.3/0.5 for expansion and contraction coefficients. Should the profiles ever cross? Thanks in advance. In general, they should not cross. Try using energy equation for high flow, and/or adjusting your bridge loss and discharge coefficients until the results are reasonable. Adjustment of your ineffective flow triggers (both spatial location and on/off elevation) may help. Also, make sure you have enough cross sections. If they are spaced too far apart, you can get weird results like profiles crossing. Thanks for the quick reply Chris. I was already using the energy equation for high flow, but I'm not entirely sure where you adjust bridge loss and discharge coefficients. Is this for a different bridge modeling approach. An interesting side note is that my profiles stopped crossing after I changed the bounding bridge cross section contraction and expansion ratios to 0.1 and 0.3. Is it correct to have lower contraction and expansion coefficients at the structure and different coefficients outside the bridge sections within the cone of influence, etc. I have 0.1/0.3 for bridge sections, 0.3/0.5 outside bridge and within cones of influence, 0.1/0.3 outside bridge and outside cones of influence. The other confusing parameter to set is the elevations of the ineffective flow areas. How is this typically done on models that have potential overtopping or upstream WS elevations that are higher than the crown elevation of the roadway? What are these elevations set at within the bridge and outside the bridge? Thanks! Typically, you want your contraction and expansion coefficients to be higher at bridges for cross sections 2, 3, and 4. However, these are somewhat subjective parameters, and if you can justify it, AND it produces logical results, then go with what works. The bridge coefficients are located in the bridge modeling approach (pier coefficients, high flow coefficients), in the deck editor (weir coefficient), and the contraction/expansion coefficients (XS editor). The elevations where ineffective flow triggers turn on/off is also subjective. Generally speaking, I'll set mine to turn off on the upstream side when the w/s elevation slightly exceeds the bridge deck elevation. On the downstream side, I usually set them slightly below the bridge deck elevation to account for the ws drawdown over the deck. This frequently requires some trial and error to make sure both upstream and downstream triggers turn off/on at the same time (or same profile). I am modeling a proposed bridge and are considering two options, one is a steel bridge with vertical concrete abutments and the other is a concrete box culvert. I am getting a very large difference between the modeling results of the bridge vs. the culvert, even though they are basically identical structures. Using bridge modeling the resulting 50-yr wsel is about 5' higher than the culvert model results and it is overtopping the road. The culvert model shows the 50-yr flow passing through the culvert with about 2' of freeboard to the "low chord" of the culvert. What is the explanation for this large difference? I assume it has to do with the different modeling techniques but would expect the results to be closer than they are. You are exactly right-the difference is that bridges use bridge equations, culverts use culvert equations. the results, especially around transition areas (low flow to pressure flow, pressure flow to weir flow) can be quite dramatic. I will usually adjust the bridge and/or culvert coefficients until the answers make more sense. Sometimes one or the other (bridge or culvert routines) are just more applicable than the other, in which case you may not be able to get one to give realistic answers. For example, trying to model a realitively small opening with a large deck can give weird results if trying to model with the bridge routines. In that case, the culvert routines are more appropriate, and trying to get similar results between modeling as a bridge and as a culvert would be a futile (and unessesary) effort. I have a question for modeling bridge. I have two bridges they are very close, but I have to modeling them as two bridges since their geomtries are so different. they are almost parallel. How can I put the bouding cross sections between two bridges? Can I use put only one cross section between two bridges for both bridges' bounding cross sections? You could try to squeeze two cross sections between them with very small reach lengths, or pick which of the two bridges will control flows and just use that. You may consider taking the most restrictive aspects of each and combine them into one hybrid bridge. The key for modeling parallel bridges is to understand how flow patterns will behave through (and over/around) the bridges and set up your geometry to capture that. You may need multiple geometries to simulate a full range of flows. Great question! Good luck. I have a HECRAS model for simple span bridge without pier. For very high flow my immediate upstream section of the bridge shows around 5 ft higher WS than the bridge section WS and it is a weir flow. Also the WS is much higher than the high chord of the bridge, which does not look write to me. The bridge geometry has been chagned for the bridge. Can you also discuss how the ineffective area has to be defined for bridge with wing wall. I think you are on the right track, thinking about ineffective flow areas to help solve your problem. However, the wing wall should not really affect the placement of your ineffective flow area. The wing walls should be inside of cross sections 2 and 3 (4 cross section bridge layout). Cross Sections 2 and 3 should have ineffective flow areas to properly define the wedge of relatively stagnate water adjacent to the embankments and away from the bridge opening. Thanks a lot. I was wondering how to play with the ineffective area. I put 1:1 in upstream cross section and 3:1 in downstream cross section. Upstream height upto bridge elevation and downstream height half height down of bridge thickness. What you think I should change to abrupt change in this immediate upstream section higher elevation than the bridge high elevation. How can I send you the photo of profile, if you can see if it looks correct. If correct than why? The immediate upstream section water elevation is 2 ft higher than the bridge top elevation. IT looks like backwater flow. But if it is backwater flow, why the immediate upstream water is 2 ft higher than the bridge high elevation. Tell me which bridge it is and I'll take a quick look to see if I can figure it out. Thank you for the post. I am currently experiencing an inconsistency with my model results and was hoping you may have be able to provide some insight. In my Profile Output Table - Bridge Only, I have a Q Weir of just under 2.4% of Q Total. However, when I review my the W.S. Elev at my Upstream Full Valley cross section (3 ft. upstream of upstream face of bridge), it is lower than my minimum roadway elevation as entered in the Deck/Roadway Data Editor. How can I have over-the-road flow (>0 Q Weir) if the W.S. Elev is lower than the minimum roadway elevation? RAS computes weir flow based on the energy elevation, not water surface elevation. Just set your minimum weir flow elevation slightly above the computed energy elevation and rerun your model. That should solve your problem. Good luck! I've encountered a tricky situation. I'm modeling a culvert and have set it up with the 4 prescribed cross sections from the manual. When I run the model, the 10-yr profile jumps above the 50 and 100 year profiles for RAS cross sections 1, 2, and 3. I tried changing the expansion/contraction coefficients, the solution criteria for the culvert, and the pressure flow criteria. When I look at the output for the culvert, it shows a drastic decrease in conveyance through the culvert for the 10-year event, but appears to be normal for the other profiles. I don't know why the model only decreases the conveyance for that one particular storm event. Any ideas would be helpful. It's hard to say without the benefit of seeing your model. I would first check to see what is different in the 4 bounding cross sections at the different profiles. Are there ineffective flows for the 10 year, but not the others? If so, could the placement of these be affecting the profile by that much? It could just a numerical error. Are you defaulting to critical depth anywhere for the 10-yr profile? That can frequently cause an unrealistically high stage just upstream. Hi Chris, I am trying to run scour calcs for a bridge using HEC-RAS steady flow regime. I find that the Hydraulic Design editor is not populating the data for the left and right overbank sections from the steady flow output file as it normally does. Do you have any suggestions? Do you have any flow in the overbanks? The scour calcs in HEC-RAS have been know to have some bugs, particularly in SI units, but I usually see this when I have no flow in the overbanks. I am new to HEC-RAS. I have a simply question. The bridge I am trying to model has 5 piers, each around 9 m placed 126 m apart along the X section. If there NO abutment along the river X-section (no significant flow obstruct along the floodplain) how should I define ineffective areas for X-section 2 and 3 just upstream and downstream of the bridge? If there is no obstruction to flow from abutments, then you could do without the ineffective flow areas (they are not required at bridges). The thing to consider is "does my bridge create significant inundated areas that do not actively flow in the downstream direction." If yes, do your best to identify those areas and mark them with ineffective flow areas. If not, just forego the ineffective flow areas at this bridge. Hi. Thank you for sharing this useful information. I have a question. I had done a river modeling by hec ras, there was 13 bridges all over the domain. But now I want to remove 3 bridges andcompare the results. I wanna know is it ok just to delete the cross section information of up and downstream of the project or I should do something else? You should leave the bounding cross sections when you delete the bridge(s). Also, remove any ineffective flow triggers that were set to account for the contraction and expansion through the bridge. Good day. Just want to inquire about adding a bridge to an existing HEC file. After adding the bridge station, a window pops out. "Warning. There needs to be cross sections on the upstream and downstream of all interior boundary structures (Bridge, Culverts, Inline Weirs). The BR at RS: [Bridge Station] does not have a XS on both sides." What does it means? How can it be solved? XS stands for cross section. You need to have at least 2 cross sections upstream of a bridge and at least 2 cross sections downstream of a bridge. Already tried using interpolated sections near the [Bridge Station] and producing bridge's centerline and edges with the GIS file, still yielding the same warning. The geometric data used was exported from Civil 3D. Did I miss some steps along the way? What can be done? Not sure. Check your Node Name Table (geometry editor, Tables...Names...Node Names). Look for the river station with your bridge (should have a BR at the end of the number). Then make sure you have at least 2 cross sections above it and 2 below it in the table. If not, then cross sections are not being imported properly. If you only have one (or less) cross sections on either side of the bridge, then interpolation will not help you. You must import cross sections. Hi. I need some help with Culvert design. I am new to HECRAS (4.1.0 version). I have a culvert length of 400ft and the road width of 100 ft. I have U/S and D/S cross sections cut at 10ft from the face of the road. When I enter 100ft in roadway width and 400ft in ;ength of culvert, the program is giving an error message. The example shows roadway width of 40ft and section spacing of 10ft and length of culvert as 60ft (10+40+10). Please help. Alos, how do I consider high headwalls for a shortened culvert lengthscenario? Your bounding cross sections must be outside the culvert. They should be a minimum of 400 ft apart. Headwalls are accounted for in the entrance loss coefficient. The tables should give you a good idea of what coefficient to use. Thank you! okay I space the cross sections atleast 400ft which means the "width" in the deck/roadway editor should be adjusted accordingly, isn't it? As I mentioned, if the roadway width was entered 100ft then the program was giving an error message. Not necessarily. You can have the bounding cross sections spaced 400 ft and still have a road width of 100 ft. That just means there is a 150 ft space between the top of the structure and the next cross section upstream (or downstream). Keep in mind, the culvert can be longer than the roadway width (and frequently is). But it cannot be longer than the span between the bounding cross sections. From left to right, looking in the downstream direction. I am designing a variety of culverts in HECRAS and I also use Ras mapper. I use culvert designs (usually circular or pipe arch). I use levees and ineffective areas. Ineffective areas on cross section 2 and 3 have flow triggers = top chord. On cross sections that are up to 5 meters downstream (ie. considered being within the expansion reach) I set ineffective areas slightly wider and have flow triggers = top chord. On cross sections that are up to 5 meters upstream (ie. considered being within the contraction reach), I set ineffective areas slightly wider and have flow triggers slightly higher than top chord. On the cross section just downstream the culvert I also use lid with low EI. = top of culvert and high EI. = top chord. Question 1: In HECRAS I have Q50 and Q200 and they are crossing just upstream of several culverts. I get warnings such as “the energy equation could not be balanced within the specified number of iterations and that the program used critical depth for the water surface and continued with the calculations” and “During the standard step iterations, where the assumed water surface was set equal to critical depth, the calculated water surface came back below critical depth. This indicates that there is not a valid subcritical answer. The program defaulted to critical depth. Any recommendations on how to solve this problem? Question 2: In Ras mapper it seems as if the program don't use the water height within the culvert. Instead, it interpolates the water height from the cross section just upstream to downstream. As a result the deck is only partially flooded in RAS mapper despite showing flooding in HECRAS. Is this a bug or is there an explanation to this? Question 1: It's very common that when your solution defaults to critical depth in one profile, it temporarily criss-crosses with another profile. When defaulting to critical depth, it's usually either a sudden contraction that is not properly defined, or not enough cross sections. You could try interpolating a few more cross sections around the cross section that is defaulting to critical depth, or try smoothing out the expansion and contraction reaches with your ineffective flow triggers. Also, check the consistency of flow distribution between your 3 sub sections (lob, ch, rob) upstream and downstream of your culvert structure. If you have roughly 20%, 70%, and 10% in your lob, ch, and rob respectively, then you should have about the same percentages in each downstream of the culvert. Proper ineffective flow trigger locations and elevations can fix this. And sometimes it requires you to have your ineffective trigger elevations slightly higher than the high chord on the upstream end and/or slightly lower than the high chord on the downstream end. Question 2: That is likely the case. I wouldn't necessarily call it a bug. It's just how HEC decided to map culverts in RAS Mapper. Probably because the terrain doesn't include the inside of the culvert, and culverts in RAS have no geospatial coordinates, so there's no way to know how to map it. I am trying to model an existing bridge in HEC-RAS by replacing the existing structure with a proposed culvert. The water surface elevations immediately downstream of the proposed culvert are coming out to be higher than existing conditions, even though the culvert has larger opening area than the existing bridge. Any idea why I am getting the results with higher water surface elevations downstream of the structure? If you have increased the flow area downstream of the bridge (not culvert), the water surface elevation should go up, with a corresponding decrease in the velocity head. This is a common occurrence when pushing out the ineffective flow areas to simulate a bigger opening. Thanks for your reply Chris. The proposed opening width has not changed much, it's the depth/rise that's increased but the overall increase is not that significant as there are not many changes happening along the roadway. I kept the ineffective flow areas the same but even then I am getting the increase in downstream water surface elevations (with a big hydraulic jump within the culvert itself). Is this common? Not sure I would say it's common, but not unusual either. I think as long as your energy grade line isn't doing anything weird, it's probably okay. This is the same issue that I am having where we are replacing an 88-ft wide bridge with a 126-ft wide bridge…for the proposed, the WSEL is lower u/s (which makes sense), but the WSEL and EGL are both higher d/s…which didn’t makes sense in terms of continuity alone. So, from what you are saying, is the energy equation causing this increase?...the total energy is constant and so if the velocity head is decreased then the depth needs to increase to maintain the same total energy between sections…??? Is there any way around this type of result? The state DEQ wants mitigation for any increase greater than 0.005’ (and we are getting increases in the 0.03’ range for WSEL and EGL)? How do you even mitigate? Jennifer- Assuming you are running a steady state model, your results should be exactly the same up to Cross Section 1 of the bridge (this is the cross section just downstream of the expansion zone). Within the expansion zone downstream of the bridge, I would expect to see a bit of a rise over existing conditions, since the new bridge is wider and there is a fuller conveyance width downstream of the bridge-this results in slower velocities and a resulting slight rise in wsel. This is a real phenomenon and can be described with theoretical equations. A qualified reviewer should recognize this, but you may need to educate them. Hello. I am designing a proposed bridge above a river, Just asking if there will be some factors to be considered in bridge modelling if the river runs directly under the proposed bridge? Also, what will be the consideration if the said proposed bridge intersects a snake-like river? I am modeling an existing bridge & the stream has a dam around 500 feet upstream of the bridge crossing. I have included the dam cross-sections as part of my analysis right now but the 10-year water surface elevation increases whereas all the other water surface profiles get lowered (even the 500-year) just downstream of the bridge. Not sure why this occurs. I am going to model the dam as an inline structure as well to see if it makes any difference. I am trying to model a systems of short box culverts (length of ard 40m). At both upstream and downstream of the culverts are long closed drains (~400m). In my HEC-RAS model, the closed drains are described using lid function. Somehow the results show the simulated water level as even higher than the lid's lower boundary. The culvert flows full. Do you know what might have gone wrong with the model? Why do you think the culverts flowing full is wrong? I am modeling a river where the flow splits around a bridge during the 100-year storm event. The road basically comes to a T after the bridge and runs parallel to the stream. I originally modeled the road as a lateral weir which allowed flows to exit the main reach upstream of the bridge and reenter into the main reach downstream of the bridge. By doing this I was able to match the rating curve from the gage on the downstream end of the bridge. However the upstream water surfaces are showing some incongruities. The road is significantly overtopped and yet there is a substantial difference (3+ feet) between the WSE of the main reach and the tributary. I then removed the lateral weir and created a split upstream of the bridge. This still is showing varying water surfaces between the main reach and tributary. Any suggestions how best to model this? I am using flow optimization. Should I manually split the flow? Any suggestions would be so appreciated. I like your first approach. I think you may have better luck running in unsteady flow. You can still use a constant discharge for steady state conditions. It's just that when using lateral structures for flow splits like that, unsteady works much better. Strange that it would run with only one cross section downstream of the culvert. Perhaps adding another cross section will get you scour to populate. Maybe you can help me with this problem with my bridges. RAS has calculated a set of curves for one of my bridges, but when I run the model, I can see in the Stage and Flow Hydrographs output that the model is using flow/stage ordinates that are below my free flow curve. Any idea why this is happening? That doesn't sound correct. I'm not sure how that could happen. Let me know if you figure it out. I have a case where I am inserting the structure of a bridge, but on either side of it; at the entrances. I have 7 culverts of different sizes and I can not define exactly what the ineffective areas. What it is done in these cases? I hope you can help me. Most people put their ineffective flow triggers just outside the outer-most culvert.
" The momentum, class B, supercritical, water surface downstream of the bridge had a higher energy than the upstream cross section. This is not physically possible. The downstream water surface has been computed by taking the momentum result inside of the bridge and performing an energy balance. " Do you know what is likely to be the consequence of this behavour (what I should change in order to make the computations work normally? It just means RAS is not able to compute with the momentum equation. In this case, I'll usually accept its workaround, or just switch to the energy method. In my experience this happens with high or significant backwater (e.g. tidal), where the energy method may be a better option anyway. I am performing a HEC-RAS analysis for a culvert replacement project; an existing CM pipe arch (9.5' wide) is to be replaced with a 12' Conspan arch. This is in the southern NJ coastal plain, with very gradual slopes. The reviewing regulator has indicated that WSE's at the upstream boundary must converge for existing and proposed conditions - or at least be within 0.04 feet (!) - for the full range of conditions modeled. I can't seem to accomplish this without making my proposed hydraulic opening smaller than the existing, which is against the regulations. Do you have any suggestions? I have adjusted ineffective flow areas, Manning's n values, bridge modeling approach, etc. without any luck. I added a cross section almost three miles upstream and am still not getting convergence for certain storm events. The biggest discrepancy I have is for the 100-year storm (0.61 feet), for which the existing condition overtops and the proposed does not. Maybe I haven't made the right combination of adjustments? Could there be a situation in which existing/proposed WSE's would not converge almost three miles upstream of the bridge? When you say the profiles are not converging, do you mean the proposed profile is lower than the existing/ If so, that should not be a problem with the regulator. In a very shallow system, the backwater effects can last for many miles. No, but it makes it easier to set up your bridge it you do. You'll have to break the culvert up into two different culverts in RAS, with at least 2 cross sections in between. The "in between" cross sections will have the inlet structure geometry, probably modeled as either a lateral structure or using a lateral inflow (unsteady flow)/flow change location (steady flow). Alternatively, you could model the whole thing as cross sections with lids. It depends on what kind of inlet structure you have. you have the option of using one of the culvert types in RAS, you can use a weir, or you can just use a rating curve, if you have one. Awesome blog! I have a steady state model with multiple bridges along a fairly steep riverbed profile. We are running multiple low flow methods (energy and momentum) and using the highest energy answer since the bridges have piers. In each of the bridge locations, the WSE drops within the bridge (drawdowns), which suggests that we are experiencing Class B low flow and will have a hydraulic jump somewhere downstream of the bridge. Our agency reviewer is suggesting that "drawdowns that occur with a structure may be acceptable if an explanation is provided for why they cannot be removed." We've tried some of the standard tricks of adjusting geometry, Manning's, and entrance/exit coefficients and cannot "remove" the drawdowns. Is there a standard way to confirm that the drawdowns are real and would actually occur under the modeled flow scenarios? I'm also struggling with an explanation other than that we believe the drawdowns are due to Class B low flow. Any light you can shed would be appreciated! Thanks! Are you sure it's Class B? A lowering of the water surface through a bridge opening is completely normal and can happen with Class A flow. The difference is in Class B flow, the flow goes through critical depth to super-critical through the bridge before it jumps back to sub-critical. Class A remains subcritical throughout, even if it displays a drawdown. If it is indeed Class A flow, there is no problem. Water surface will always decrease in a contracted section. This is covered in any open channel flow textbook and the reviewer should be aware of this. If it is Class B flow (dips below critical depth), then the only thing you can do to get rid of it (assuming it is not there for the "no-bridge" alternative) is to lessen the contraction. In other words, make the bridge opening bigger and smooth out your ineffective flows in both the contraction and expansion reach. If any of your cross sections "default" to critical depth, that means there was an error with the computations and you need to fix that before you can use the results from the model. I have a follow-up to this. Is it normal for the model to display a drawdown in open channel portions that have sudden expansions/contractions in floodplain area? I have a 500-year flood run that shows a drawdown in a cross-section where the HGL is completely contained within the river channel just upstream of a cross-section where the HGL expands into an open floodplain. The model is not defaulting to critical depth, and the EGL is smooth and believable through the transition. The model seems to perform similarly for the 100-year flood run as well, only the drawdown is less pronounced/noticeable. Thanks for any comment you can provide! Yes, that is quite normal. Where a cross section is constricted relative to its neighboring cross sections, you should expect a decrease in water surface elevation (sometimes very slight). Most hydraulics/open channel flow text books discuss this phenomenon. This is common underneath a bridge constriction, for example. As long as your energy grade line is smooth, and not increasing in the downstream direction, you probably have a good solution. I'm having some issues with a very skewed bridge. I have already skewed the bridge 45 degrees. Due to the skew the us and ds cross sections are far away from the bridge because if they were any closer they would cross over the skewed bridge, so adding ineffective flow areas isn't really a solution. I'm using unsteady flow with a relatively low slope (0.008). The problem I am having is that the water surface bulges significantly underneath the bridge. The geometry is a consistent width and shape from approach to exit so there isn't any contraction that would explain the bulging. I have toyed around with different contraction values but it doesn't really make a difference. Any ideas/tips/tricks? thanks! The upstream and downstream cross sections that bound the bridge should be parallel to the bridge. Then you skew those cross sections as well as the bridge. Hope that helps. Hello! Congrats for the super helpful blog... I have to estimate scour for a new bridge with 3 openings on a wide floodway with 2 extra relief culverts. Just upstream there is an old bridge with openings that cover the whole floodway (therefore scour depth is an important issue) . The new openings and culverts align with (some of) the upstream openings. Hec Ras does not calculate scour for multiple openings. How would you go around this?? Thanks Katia! I would recommend running it as a multiple opening in RAS, but then compute scour external to RAS. I usually do scour on a spreadsheet. The bridge scour routines in RAS are outdated and a little bit confusing to use properly. Get ahold of the HEC-18 document from Federal Highways for the latest methods for computing scour. Hi Chris. I'm having an issue with my hec-ras model upstream of my culvert. I have 3 cross-sections defined upstream. And when I run the smaller storms-1&2-yr events, the water surface elevation goes below my ground surface elevation at each alternate section. I know that's a mistake ... But not sure what could be causing this error. Any thoughts? If unsteady, sounds like your model might be unstable. Hey Chris. I'm new to HEC-RAS 5.0's 2D capabilities. I have been able to set up a small model as a test case for a stream bank stabilization project I'm working on. There is only one problem. My flows are going from downstream to upstream rather than upstream to downstream. How is the flow direction set when running a 2-D model only? Flow direction is determined in a 2D area strictly from higher energy to lower energy. Typically, if you place an inflow hydrograph on a 2D area boundary, there will be higher energy there, so the flow will be driven in that direction. However, if you have a tidal downstream boundary, or some other boundary inputs, that can affect the flow direction. For a simple case, if you put a flow hydrograph boundary condition on the upstream end and a normal depth boundary condition on the downstream end, you should see flow generally move from "upstream" to "downstream". Hey Chris. I'm relatively new to the 2-D modeling capabilities of HEC-RAS 5.0. I've set up and successfully run a 2-D only model for a stream bank stabilization project I'm currently working on. There is one minor problem...the flow runs from downstream to upstream rather than upstream to downstream. How does the 2-D only component determine the flow direction? Hi Chris, thanks for the great blog! I am running into an issue with modelling the flow through my open bottom culvert (Conspan Arch). The realigned low flow channel runs through the culvert. However, the low flow channel banks partially extend up the culvert sidewalls; thus, rendering blocked flow areas within the culvert. When viewing the cross section output it appears that the model is utilizing the blocked area by the banks as effective flow area. In attempt to solve this problem, I started playing around with the "Depth Blocked" in the Culvert Data Editor, but this seems to just block the low flow channel out entirely. Is there a way to negate this blocked flow area within the culvert, using any parameter inputs? Or, what would be the best way to model this low flow channel through the culvert? Hi Brittney. I'll give you a couple of options. If you are not too concerned with the results inside the culvert, and just interested in how the culvert itself affects the reach upstream of it, you can use another culvert shape and give it a similar flow area to depth relationship. Just make sure when you adjust the flow area, do so by narrowing or widening the culvert, not by changing it's height (that could have an effect on the transitions between equations). Second option, which would be better if you are interested/concerned with the results inside of the culvert, would be to model the conspan not as a culvert, but as cross sections with lids. Then you could make any shape you want, including yours with the low flow channel inside the culvert. Hi Chris, what would be the possible reasons to have a higher water level corresponding to low flood discharge than to high flood? 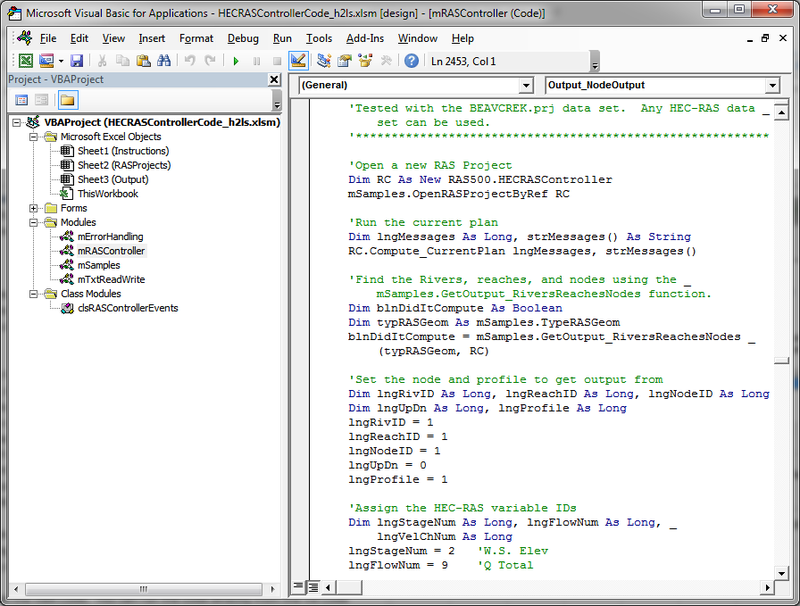 I am using RAS (v 3.0.1) for a bridge widening project. We showed no-rise in WSELs between the proposed widening and the pre-project condition. All that is fine. However, I am seeing some increases (max. 0.08 ft) upstream of another structure (culvert) which is almost a mile upstream of our subject bridge. It should be noted that barring the subject bridge there were no changes anywhere else between pre-project and proposed conditions. It is rather perplexing. Is this something common? Would this be an example of inherent inconsistencies with the bridge/culvert routine? That is not common, except for very shallow rivers. I assume this is a steady flow model? If everything is indeed the same between the proposed bridge and the upstream culvert, I can only assume that there is some minor effect. Is the reach very shallow? In very shallow streams/rivers, backwater effects can project upstream for many miles. Thank you first of all for taking the time to answer my question. Yes it is indeed a steady state model that I am working on. As to the channel, I wouldn't consider it to be shallow (it is about 12-16 ft deep in the reach upstream). And for some reason, this is evident only for the more frequent storm event (10-yr) among the events modeled. AJ, my apologies, by shallow I meant in slope, not depth. In other words, a very "flat" river. I’m modeling a bridge in HEC-RAS 4.1. I have the low flow bridge modeling approach set to compute Energy and Use Highest Energy Answer—none of the other methods are set to compute. The output tables show the Br Sel Method is Momentum. Why would it do that if I didn’t select Momentum to compute? I tried changing to compute Energy and Use Energy, but it still shows the Br Sel Method is Momentum. Any suggestions? Check the Summary of errors warnings and notes. Occasionally if RAS has a problem computing with one method, it will automatically switch to another. When it does this it usually tells you about it in the Summary of Error's Warnings and Notes. Hi chris, i'm a newbie on HEC-RAS, i have a question. 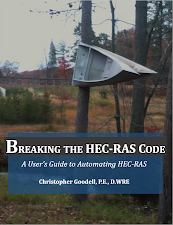 I've seen many problems on rivers compute by using HEC-RAS, do HEC-RAS can be used to compute flume study just for re-checking, thanks. Greetings. I'm starting with HEC-RAS and trying to model a simple culvert. When I select bridge/culvert, no river station is in the list, goes to Options/add a bridge and/or a culvert and select the river station appears the Warning - A node already exists on reach "name reach" at river station "RS number". I've just made the reach and a few cross section, don't know what's happening. Thanks! Hi. Did you try a different R.S. number for your culvert? Make sure there are no cross sections with the same R.S. and make sure that you have at least two cross sections upstream and 2 downstream of where you are putting your culvert. Hi Chris, I am somewhat new on HEC-RAS and I've ran into a problem. When modeling an existing dam, I am using an SA/2D connection and I have put in what seems to be the correct information for my parameters. I am able to get my model to run (unsteady model), however the WSEL seems to drop significantly near the outlet... up to 7 feet! Therefore the model is not allowing any flow through the emergency spillway (Which happens in a similar storm in real life). Do you have any idea what is causing this drop in WSEL? Sounds like either your model is unstable, or perhaps your SA/2D connection HTAB parameters need refinement. Try providing more resolution to your HTAB parameters for the connection. If that doesn't work, send me your data set and I'll see if I can figure out what's happening. That sounds strange. Without seeing your model, I'm not sure I can troubleshoot it. Feel free to email it to me and I'll have a look. goodell@westconsultants.com. Chances are its too big to email. You can upload to Google Drive or something similar and send me the link. Hi Chris, Great Blog it has been very useful! I have a project I am working on where we have a culvert that is an existing Stone Arch (semi-circle) atop vertical abutment walls. I can not figure out a way to model this as a culvert because the standard shapes do not adequately represent the openings, is there a way to manually enter a culvert shape or another way to model this scenario? I have run the model as a bridge but the results do not accurately represent the flow conditions expected. The proposed scenario is going to be lining the existing culvert with a material with a little lower manning's "n". The culvert is through an existing railroad embankment that is very tall and causes ponding for the 100-year and 500-year. Do you have any suggestions on how to model this? You might try a conspan. Code the vertical abutment walls as part of the geometry of the section, then place the invert of the conspan at the top of those walls. If that doesn't work, you could try modeling it as cross sections with lids. That allows you to code in just about any shape you can think of. However it will only use the energy equation (as with normal cross sections), it will not evaluate inlet/outlet conditions. The conspan approach does not work because the shape is drastically different than the arch that is out there. I had considered the cross sections with lids but we need the inlet and outlet conditions modeled to account for increase efficiency with the entrances and exists. I could try coding the abutments in the sections and placing the arch above it but wouldn't that skew the results since the submergence will only be calculated based on the rise of the arch portion entered at the top and not include the vertical wall portion? I had tried using a box culvert with an arch placed on tope so the bottom of the arch and the top of the box coincided but is seemed like it only split the flow between the two sections but had obtained some wacky results doing that too. Not sure about skewing the results. Might be worth trying. If that fails, then I think you're stuck with using the "best fitting" culvert shape. Remember, flow area and rise of the culvert are most important to match. It's better to adjust the width than the rise to match flow area. I am new on HEC-RAS. I was wondering if you could be able to assist. A change (or known value) in WSEL or EG at a node at river station 100 in reach D caused a WSEL below the bottom of the cross section. How do I go about solving that problem? I have viewed the cross section input data but there seems to be no problem with my input data. My guess is that your flow rate is very low, producing very low depths. This is particularly problematic in steeper streams and/or cross sections with relatively wide and flat channel bottoms. I would suggest either adding in more baseflow to your hydrograph, increasing Manning's n values (if appropriate! ), or getting better terrain definition in the main channel. More cross sections in steep reaches can help as well, especially around significant changes in grade. Finally, if all else fails, you can try putting in pilot channels (search the HEC-RAS manual for how to do this). Hello Chris! Great blog, very intresting and useful! May I ask you a question about lids in HEC-RAS? I've read in User's manual, chapter 16, that lids can be used to simulate a pressure flow in a close channel. I'm working on a long culvert with variable sections and slope and I've modelled it as a normal set of cross-section with lids on the top. I'm working a steady flow simulation. After running the model, i've noticed that in may section the WS is above the top of the lid. There are also some section with WS IN the lids, between the lower and upper chord! There is an option for lids to allow pression flow likewise bridges (pressure and weir flow mode, in brige modeling approach)ad culverts? Hello Chris! Great blog, very intresting and useful! It depends on the questions you are trying to answer with HEC-RAS. Bridge scour? No rise analysis? Flood study? I'd say a simple steady flow analysis would do. You'll just have to squeeze at least 2 cross sections between the bridge and the dam. The DEP requirement for HEC-RAS is 500' on either side of the bridge. Sounds like a conversation with someone at DEP is in order. I have encountered an issue where my high chord bridge elevation in the deck/roadway editor is 86.13 ft, but when I view a run in the profile plot, it displays the high chord at 84.92. All my numbers and file's appear to be correct - nothing obvious is sticking out as a possible reasoning behind this error. Any ideas on what this could be? Can a scour analysis be run for a culvert or dam as well as for a bridge? We have a model where we are proposing a new 18x8 conspan upstream of an existing 8x11 box culvert. The distance between the culverts is about 60'. We've tried modeling it as one culvert and as two separate ones in series. When modeling as one culvert, we are getting a no rise result. When modeling in series, we are showing a rise of approximately 2 feet upstream. I wouldn't think that the conspan which has a higher capacity than the box culvert would cause such a substantial increase in the WSE but the reviewing agency seems to think that modeling it as one culvert is not acceptable. Any advice/tips you can provide to help? Chris, Thanks for the response. I think we've resolved the modeling issue. We have reduced the expansion and contraction coefficients between the two culverts and also set the calculation option to be an outlet control condition. We have verified that it is indeed an outlet control condition using the FHWA culvert design equations. Make sure you max out the number of points and number of curves in your Htab parameters. Also make sure that your maximum headwater is just above the maximum level the water will get to. Finally, this is optional, but you can also set a limit on discharge to try to tighten up the curves even more. That being said, sometimes it's just too difficult to model a bridge with a dam breach flood wave. Some people will replace the bridge with a culvert or even an inline structure with a gate to get it to work. Good luck. I'm modeling a culvert under a road that has weir flow. On the upstream side, almost the entire left overbank is high ground upstream of a small swale/ditch along the road. On the downstream side, the ground is lower than the road in the left overbank. Should the shadow of the upstream high ground limit the available weir length provided by the road itself? If i use cross section 3 for the internal, the weir flow is blocked but i can use section 2 for both internal sections and have the full road as possible weir flow. I am modeling a road crossing of a rectangular concrete channel at a 1% slope. The cross section does not change at the bridge. The flow is super critical so it stays inside the channel and should not touch the low chord of the bridge. RAS is creating a big at the bridge. I can see no reason for this except that RAS appears to use the energy grade rather than the water surface at bridges. With the super critical condition, the energy head is well above the low chord. I have decided to try to model this with out the bridge in place. Your thoughts would be appreciated. I can send the model if you like. RAS provides a way to use the water surface elevation rather than energy elevation just of such a case as yours. In the bridge editor, go to Options...Pressure Flow Criteria. Change it to "Upstream water surface". Then rerun and see if that helps. I think I might have the same problem here, and it's starting to drive me crazy. I am modelling a bridge with a culvert (actually 3 bridges with culverts) in a rather steep area (around 5%). I changed pressure flow criteria to "upstream water surface" and the geometry of the channel is converging to the culvert geometry. I still get this very high water surface elevation just right before the culvert, although in the culvert (or downstream) there is supercritical flow with WSE nowhere near the low chord. This only happens when the EL at the upstream culvert xs is higher than the low chord (and yes, I really have selected "upstream water surface;)). The only clue I found was that this does not happen if I change the calculations from "mixed" flow to "supercritical". So I think what might happen is that HEC-RAS computes a subcritical water depth between the cross section upstream of the culvert and the culvert itself (because they are at the same ground elevation). Could this be the case? And if yes, how do I get rid of it? I am modeling a combination of culvert with a bridge. The bridge is built above a battery of culvert. i dont know if Hec-Ras allows to model this kind of hydraulic structures? i'm modeling a culvert with a development upstream of it. there is a natural channel in the existing topography that is extremely large-i have calculated its capacity and found it to be able to carry almost 1000 cfs. However, my results are showing that this channel can't every carry 600 cfs. i assume this is due to a backup from the culvert entrance, but i've done some trial and error and enlarged the channel to try and see at what point it could handle my flow, and it seems no matter how much wider/deeper i make it, HEC-RAS just shows the same water surface elevation, and just fills the channel and continues to spill over towards the development. Is this a problem with how i'm modeling it? have you seen this happen in any other circumstances? Not sure. Could it maybe be under TW control? That might explain it. Here is my issue. WSE is higher at upstream of a culvert, compare to to WSE at downstream, for any large storm events like 50-100-500 yr. However, for 10-yr storm event, it is the other way around; i.e., WSE at the upstream has a drop/smaller and hits the Critical depth. What is that happening and How I would be able to fix it? Most likely a better placement of ineffective flow area triggers would solve this problem. Usually that dip to critical depth is because there is too much contraction in the approach. I am wondering if anyone has run into a similar situation. I'm modeling a pre- vs post- bridge widening (12' increase) analysis on an old bridge. The existing bridge overtops at Q50, so I raised the low chord of the bridge and lengthened the bridge. In short, my SWE jumped by nearly 2.5' in the post improvement scenario whilst the bridge opening increased by over 100SF. I checked the ineffective areas, post-improvement changes in the ineffective areas only account for a fraction (.3') of the change in SWE. Is it the different modeling approaches: weir for pre- and energy for post- cause the near 2' difference? Is there a way add river wall to hecras? I want to print crosssection with riverwall on each side. I'm running existing and proposed models for bridge replacements. However, i keep seeing a decrease from existing to proposed that doesn't make any sense. My existing bridge opening is approx. 72 SF. I started out using a box culvert with a similar opening size, but saw a decrease of nearly a foot at the upstream end of the opening. I started fooling around with different sizes, and still saw a decrease when i took the proposed culvert down to a 2'x2' culvert with a 4SF opening. Obviously there couldn't be a decrease in water surface elevations when the opening goes from 72 SF down to 4 SF, but the models are exactly the same with the same flow rates aside from the bridge/culvert. What could be causing this? For some reason the program is creating an encroachment in my model in my upstream bounding cross section. HEC-RAS is setting the encroachment from the left stream bank to the center of my stream at an elevation equal to the 25 year WSE. Do you have any idea why the program is doing this and how I can remove this encroachment that I did not input? I can only assume that this strange occurrence is the cause of my 25 year WSE dropping below my 10 year WSE within the structure. Thanks for reading! That is a strange one indeed! I've never heard of mysterious encroachments showing up. I wonder if something is stuck in the plan file that isn't showing up in the GUI. You might want to open the plan file in a text editor and see if there is any encroachment data stored there. If so...delete it. Also, this is a long shot, but open up your unsteady flow analysis window and make sure you don't have an encroachment set there (for unsteady flow). Please report back if you figure it out. Good luck. Hi Chris, first of all thank you for the advices, very useful not only for beginners. I actualy have a doubt in modelling with HEC-RAS a bridge that has a jump below it; I wander if I have to put the jump in the same sections where the bridge is included (I mean XS’s 2 and 3) or if it is better to put it just before (upstream) the bridge. The solutions I’ve obtained can be very different for increasing discharges. You're welcome! I'm not sure what you mean by "jump". A hydraulic jump? or a "jump" in the geometry/terrain? In general terms, it's best to put geometric features where they actually are. If under the bridge, put it under the bridge by modifying the internal bridge cross sections. If upstream put it in the upstream cross section. Thank you Chris for the answer, I intended with 'jump' a discontinuity of the bottom (it was a bit ambiguous). Anyway I don't understand how to modify the internal bridge cross sections. Is it possible? Yes! In the bridge editor, under the Options menu item, there is a selection for "Internal Bridge Cross Sections". There you can make changes to the internal sections BU and BD. Oh, it's true! Thank you very much Chris! I skewed my bridge sections 30^ and the bridge shifted so much that I could not see the piers (hidden by cross section) visually. What is the issue in here? Hope you doing well. i am modeling a barrage using inline structure option in RAS 5.0.3. The problem i am facing is that the barrage has total of 66 gates and i have model upto 40 after 40 model is displaying an error that there is a limit of 40 gates group . so i am unable to add the remaining i will be very thankful to you if you have some suggestion about this? If any of the gates are the same (shape, size, type, invert, etc), just in different loactions along the barrage, you can put them in the same gate group-just use a different centerline station for each one. I believe you can have something like 20 (maybe more) gates in a gate group. See if that helps. Thanks for the really great blog. I'm having an issue with my steady flow model. The channel is very flat (average 0.1% slope) up to an existing 300ft, 72" culvert. The culvert slope is 0.5%, and the channel at the outlet is 2.5% for roughly 1000ft to the confluence. I initially ran the model with a subcritical flow regime, however, the flow in the culvert was shown to be entirely supercritical so I adjusted it to mixed flow. With this adjustment, I receive the following error: "The flow through the culvert is supercritical. However, since there is flow over the road (weir flow), the program cannot determine if the downstream cross section should be subcritical or supercritical. The program used the downstream subcritical answer, even though it may not be valid." The bridge modeling approach is set to weir/pressure flow. Any ideas on how I can correct this? Kevin- how much are you concerned with the detail in the culvert. Is that the purpose of the study, or is it more of a reach-wide flood study? If the latter, I'd probably keep the model as is and not worry too much about the warning message. If your model's purpose is to study the detail inside of the culvert, you may want to do some hand calculations to verify what RAS is giving you. I'm not sure you can get around this warning message. I modeled by using unsteady flow analysis for a 170 km long river. I get geometry data in the form of DEM data so as to get the elongated and cross-sectional profile used civil 3D then export it to HEC-RAS. In the determination of station "0" starting from the estuary to upstream (0 + 00 at the estuary and 170 + 00 on the upstream) and my direction isn't backwards( from upstream to downstream ). Do you have any suggestions for fixing it, Chris? I am new to HEC RAS. I am running steady flow for the existing and proposed bridge. The proposed bridge is longer than the existing bridge. I wondered why my the proposed's area of opening is smaller than the existing's area of opening, and the velocity through the structure and channel velocity are larger than the existing. What are the issues there? Would you please help? Thank you. That doesn't sound right. Do you have any images you can link to help show what you have? Thanks for replying Chris. I could not provide any images. And one more question, does the beam for proposed bridge suppose to be deeper than the existing beam? That sounds like a question for your bridge designer. I am trying to model a bridge replacement along an interstate corridor. There is an eastbound bridge and a westbound bridge separated by approximately a 35' median. The eastbound bridge is only being replaced. Should I model the bridges as two separate bridges or one whole bridge? Another question comes to mind on what to do with the piers for each bridge, if I model as one whole bridge? Also, the replaced bridge may have different pier locations, low chord elevation and top of bridge elevations. What to do there? Will there be problems arising from modeling either way? Any help is appreciated. Thanks. I would probably model that as one bridge. Include all of the piers (old and new bridge) together in the single modeled bridge. Thanks for the site. I have a question, if we want to model a culvert with two different slopes in HEC, what would be the best solution for that. I modeled as two separate culverts but not really sure it is the best idea. You're welcome. In this case, you can explore using cross sections with lids, instead of using the culvert option. This will allow you to have a break in slope. The downside is you won't be able to use the culvert equations. But many people have used this technique successfully in the past. I am using HEC-GeoRAS to import Bridges/Culverts data into RAS. When I go to run RAS Geometry for Bridges/Culverts the River/Reach Name & Stationing runs successfully but the elevation does not. It keeps giving me this error "Error occurred in Elevations tool!". Do you know why? Is my terrain file too big (36.78 GB)? I have an odd problem: I'm modeling a proposed bridge in a concrete-lined trap channel. The bridge abutments are outside the banks and there are no piers. The model is run in mixed flow, steady state. The design discharge is completely contained within the channel and never interacts with the bridge (the water surface never gets as high as the soffit, nor does the water go overbank to interact with the abutments. When I run the model and compare the existing and proposed conditions the model output tells me there is a change in both velocity and depth below the bridge. I have tried using both energy and momentum equations, but no matter what I do the model tells me the hydraulic parameters change. There should be no changes in channel hydraulics since the discharge never "interacts" with the bridge. Any suggestions on how to resolve this? If you have relatively fast flow under the bridge, it could be that the energy grade line impacts the deck, even though the water surface does not. By default, HEC-RAS uses the energy level to determine when pressure flow begins. That might explain the difference. You can change RAS to use the water surface instead of the energy by going to the Options menu item in the bridge/culvert data editor and select Pressure flow criteria. Then change it to "upstream water surface". Hope this helps. That didn't resolve the issue. I'm assuming that the problem has something to do with the super-critical flow in the channel, but I can't figure out what bridge modeling options are creating the (real world) error. Any other suggestions? Without seeing it, I can't think of what would cause that. Why don't you send me your model and I'll take a look. Chris, I am running a HEC-RAS scour analysis on a few bridges that are over-topped during the design event. I am getting strange results, as usual, but I just wanted to see if you concur that the scour routine is not valid for over-topping events. I offer as proof the fact that the default value populated for channel flow through the bridge opening is greater than what the hydraulic results show for the same bridge. Furthermore, the certain variables, such as "Left overbank average depth inside the bridge opening" continue to be populated even though they technically don't exist. This occurs even when the bank stations are well outside of the bridge opening. Randy-That's not surprising. I would caution against using the scour routines in HEC-RAS. They are based on an outdated version of HEC-18, they're no longer maintained, and they make a lot of assumptions that may or may not be valid for a given bridge/flow event. Each bridge is unique and requires a careful eye to make sure you are using the HEC-18 bridge scour routines properly. I like to use RAS to get my hydraulic output, but then I use a spreadsheet I created that computes scour using the latest HEC=18 methodology. You can’t have two different slopes. You can either use a single representative slope, or if it is really important to show two different slopes, you can build the culvert out of cross sections with lids. Do I need to make two different culvert and connect them for 2 different slope or can I make one culvert with variable slope? I created first culvert at upstream 544.19 with upstream 550 and tried to create one more culvert at downstream of slope change at 519.19 but I am confuse what upstream distance do I need to enter (as 519.19-519.9=0 or 550-519.19=30.81 and same as width what do u need to enter. I am tried to connect two culvert for my different slope. or can I do lid in cross sextion and make different slope so that one culvert will solve my issue? If you want to be able to have two different slopes, you have to do. Ross sections with lids. I am modelling a bridge and when I attempt to run, I get the following error "A flow needs to be specified at the top of the reach". Thanks for all your detailed responses, they have been very helpful! I am modeling a three-span county bridge replacement and am having problems with the deck displaying in profile -- it will display low chord but not high chord or deck. Do you have an idea of what might cause this? The reach has very wide floodplains (1000' each side of bank). I've tried extending the deck to match the extents of my cross sections, but haven't had any luck. Hi Kyle. The profile plot displays the lowest point on the upper chord definition. This includes the approach to the bridge in the overbanks. If the bridge is perched above the floodplain you may not see it in the profile. I am modelling a bridge with multiple culverts. When I run my analysis The water surface elevation stays pretty low until it gets to the culverts then it raises and the water is not going through the culvert. Its going on top of the bridge. No matter how low i adjust the elevation it still goes over the bridge deck. Any idea on the problem? Hard to say over the interweb. Suggest double and triple checking your input data. It’s covered pretty well with in the manuals. Also you may want to review some of the example datasets thatbinclud bridges. Embankment Station/Elevation Table” accepts only up to 500 stations values in increasing order. Whereas I have 36866 Embankment Station/Elevation Table. How can we solve this issue, any idea?